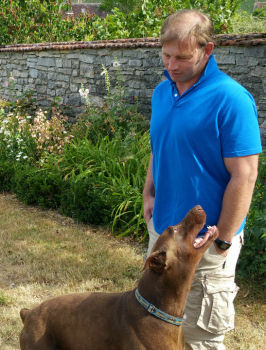 Olivier Phillipot seems like a man with boundless energy, as he fends off a ferocious-looking guard dog or two at their family château, whilst delving into the intricacies of its tiny monopole vineyard – a ‘clos’ or walled garden – that may be a small part of their 27 hectare domaine, but one of which he is very fond. 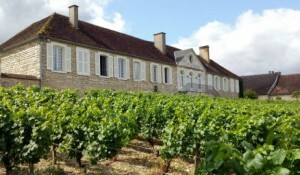 Until 2006 the winery was based in the château (below), as they sold most of their grapes and bottled very little. 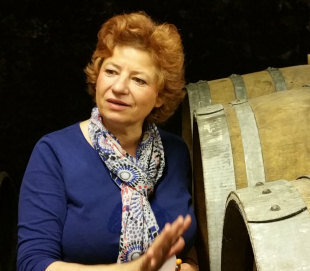 Since then, selling to négociants like Drouhin, Leflaive and William Fevre is still a big part of their business, but they now release 30,000 bottles annually, and this year will bottle the ‘clos’ as a single-vineyard wine for the first time. In terms of winemaking in their new cellars, all the quality signs are there: conveyer belts to move grapes, vibrating sorting tables and an array of glittering small tanks to vinify parcels separately. He does inoculate rather than using wild yeasts (“I worry that ambient yeast can lead to mistakes,”) and ferments are long and cold, taking up to three months to complete. 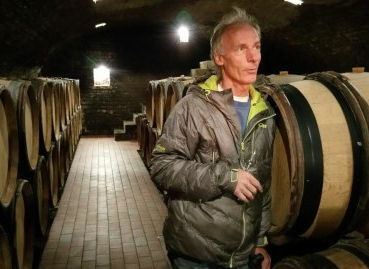 Some small 228-litre barrels are used for Chablis, but uses only large 600-litre barrels for his Premier Crus. A slightly rushed appointment, which was shared by a large group from one of Dauvissat’s American importers, meant this visit was mostly about the tasting rather than talking, but I guess it is fair to say these superb wines really do speak for themselves. Dauvissat’s wines are amongst the most sought-after and elusive in all of Chablis, from a deeply traditional cellar where all wines spend at least a year in old wood, and vineyards that are farmed meticulously. Another generational wine domaine, Vincent Dauvissat carries on the work of his grandfather who was one of the first to bottle all wines from estate-grown grapes in 1931, and he is uncompromising in his views and winemaking philosophy. The Dauvissat holding is almost 30 hectares and Vincent began converting his vineyards to organic practices in 2002. Yields are low by Chablis standards, never more than 50hl/ha. The result of this hands-off, traditional approach and attention to detail are very finely etched wines indeed, with a reputation for great longevity and complexity. The samples tasted here, back to a 1996 ‘basic’ Chablis, would bear testimony to that. It is in some ways remarkable that such a big regional cooperative as La Chablisienne produces generally excellent, and some outstanding terroir wines. A mutual society owned and run by 300 growers and founded almost a century ago, La Chablisienne is a huge force in Chablis: their members farming a quarter of the entire Chablis vineyard area and making them the single biggest white wine producer in all of Burgundy. La Chablisienne produces thirty different bottlings of Chablis: six of the seven Grands Crus, 15 of the 17 Premiers Crus, Chablis and Petit Chablis. Among their Grands Crus is Château Grenouilles, a true Château and vineyard purchased in 2001, giving La Chablisienne more than 7.2 hectares of the 9.2 hectare Grand Cru. The remaining two hectares is divided between seven producers. As I said at the outset, La Chablisiennes quality is excellent. In truth I found their wines lacked the vital last degree of brilliance, of expressiveness, to match the very best of the small artisan producers, but that is not to deny that as a driving force of Chablis they do an outstanding job. Having taken over from his father, Roger, in 1991, Stéphane Moreau (right) is the sixth generation of Moreau in charge, and despite the ultra-casual attire, undoubtedly one of Chablis’ most serious winemakers. Reportedly a ‘devotee’ of Vincent Dauvissat, he is nevertheless very much his own man, with strong views on farming and wine making. 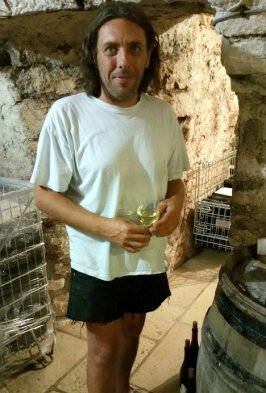 Though he has worked organically for many years he says he prefers not to be organically certified: “I reserve the right to use chemicals in an emergency, if it will save the harvest.” Nevertheless all work is done according to the biodynamic calendar and there is tremendous attention to detail – even his Petit Chablis is harvested at 50hl/ha, the same as some growers Chablis and even Premier Cru. The Moreau-Naudet company was formed in 1950 through marriage between the two grower families, and Stéphane has access to some very old vines indeed from their holdings. He vinifies with natural yeasts and a very low sulphur regime, and makes the wines in large old barrels. His vineyard holdings included the famed premier Cru Forêts, consistently one of Dauvissat’s best, and on my tasting here, equally successful for Stéphane Moreau. 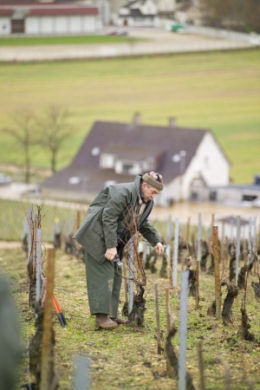 The Vignoble Dampt is a popular and large concern, making wines from across Chablis and the greater Tonnerre region of Burgundy like Irancy, Sauvignon St Bris and Crémant. Here the ever-busy Emmanuel Dampt met me to pour sample after sample, whilst also tending to a busy stream of local customers tasting and buying from the cellar door operation. The wine business was started only in 1980, by the Dampt brothers’ father, Bernard, although the family has worked the land for many generations. 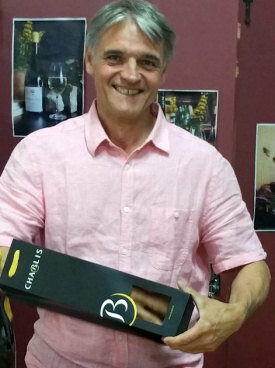 For many years they supplied the La Chablisienne cooperative, but as Bernard’s three sons joined the business, the move to build their own winery and market their own wines began, and by the early 1990s, Dampt Frères was born. Today they farm over 60 hectares, some owned, some leased, producing half a million bottles. In Chablis, for their Grands Crus everything is hand harvested and around one third is vinified in barriques. Their functional, warehouse-like cellars reflects the no-nonsense approach of the Dampt brothers rather well. That explains why this seemingly modest domaine today produces no fewer than five Grand Crus and four Premier Crus, all aged in barrel (as is a small proportion of their straight Chablis). It is a small and, at first glance, ramshackle winery, with kids toys scattered around the garden and nosy cats following us through the house, but look closer and there are sorting tables, conveyers, pneumatic presses and a brand new extension to the cellar built in 2014, brimming with small stainless steel tanks and air conditioning. The generosity and warmth of Marie-Ange, plying us with breads, cheeses and meats to “have a picnic,” is in many ways echoed in the wines.